I have a brilliant, hilarious, wonderful amazingly kind hearted, incredibly selfless friend name Maggie. I completely and absolutely stole this image from the Let’s Bubble America! Contest. I don’t deserve any credit for the sheer beauty she’s shining. That all goes to the Chicago Ad Agency. High five ad agency. You captured all of her awesome! Body of Email: So. I think I have the best and most random story ever to share with you today. It is about Scrubbing Bubbles. And I know what you’re thinking: “what do you mean a story about Scrubbing Bubbles?” Well, my friend…it is an awesome story. Very few people would appreciate it as much as you! So back in October, I saw that Scrubbing Bubbles was asking for nominations for an upcoming promotion called LET’S BUBBLE AMERICA. They were looking for non-profit organizations that were in need of a DEEP CLEAN from Scrubbing Bubbles. I got to thinking about it and realized that The Gathering Place (the soup kitchen in LNK at 14th and E…I’m guessing you know about it and/or have volunteered there) would definitely qualify as a non-profit in need of a deep clean. TGP is in an old home built in 1900, just south of the governor’s mansion. It is huge and old and, well, not super clean. So, I filled out an application/nomination for TGP, uploaded a photo, included a few paragraphs about how awesome TGP is, and moved on with my life. Literally, forgot I even did this. Until Wednesday when my phone rang. It was Ogilvy, an ad agency out of Chicago who handles Scrubbing Bubbles for SC Johnson. After confirming my identity, the woman proceeded to tell me that out of the 700+ nominations they received, they had decided TGP was one of the top 9 finalists for LET’S BUBBLE AMERICA! LOL The winner will be decided by nationwide vote (March 15-April 15). She then proceeded to say that Ogilvy will be sending a representative to LNK next week (Wedn) to (1) interview me; (2) interview the director of TGP; and (3) take video footage that will eventually turn into a 30 second video for TGP. Each finalist will have a 30 second video on the voting page. AND THEN it got funnier. The top three vote getters (nominator and nominee…so me and the director of TGP, if we are top 3) will go on THE QUEEN LATIFAH SHOW with QUEEN LATIFAH and TIA AND TAMARA MOWRY (Sister Sister girls…however you spell their last name). LOL. LOL. LOL. THIS IS REAL. I might meet Sister Sister and the Queen. The grand prize is a clean (services and products) valued at $10,000!!!!! The Gathering Place director is seriously freaking out. And so am I!!!! Isn’t this the funniest thing you’ve ever heard!?!?!??!?!?!?!? And here’s the thing. It was pretty stinking funny. But it’s also one of the most awesome things that I’ve ever heard. I LOVE Maggie for taking a moment when she thinks “this would be great for them” to actually submit them, to share part of her story and to share the story of an incredible organization that does so much for the community. What’s this place that she so loves you may ask? Great question! The Gathering Place is a soup kitchen in Lincoln that serves over 30,000 meals every year to one of the towns low income neighborhoods. And they are in an old building and they rely almost solely on volunteer help, and that just means that a $10,000 deep clean would really go a LONG way for this great place. Wrong. I’m not biased (but you’re maybe 56% right about the Sister Sister thing) about Maggie being awesome. And I know that because Cindy Lange-Kubick wrote an article about the whole thing here. 1) Take a moment and GO VOTE! You can vote every.single.day. if you want. Heck, you could set a reoccurring appointment on your calendar and just do it every day really quickly before you leave work. Or while you’re making dinner. Or eating breakfast at the breakfast table. OR you can just vote once if this is the only time you think about it. But I’d sure appreciate if you took 5 seconds out of your day to click that link and vote real quick like. Maggie would appreciate it too. And so would The Gathering Place. Basically what I’m saying here is, that five seconds of your life would mean a whole lot to at least two people and one very cool place. 2) The next time you have a moment for a random act of kindness, do it. It may be one quick moment out of your busy life, but it could mean incredible rewards for someone (or something!) else. A deep clean for this place? 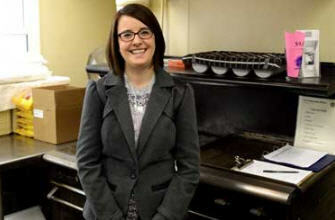 That affects 30,000 meals being served next year. That’s just completely overwhelming to think about. And worth every second on the front end out of your packed day. And as an added bonus kids, remember, one small act of kindness could lead you to meeting Queen Latifah. Which, is basically the best random payoff… like ever. I have a little Valentine’s Day tradition. I eat heart shaped pizza and enjoy a bubbly drink. I blame one Jenny Swarth for that. It started in college for no particular reason. And it stuck. And now, I feel very strongly that Valentine’s Day isn’t complete with those ingredients. Sadly, J Swarth moved away for grad school, but the pizza and bubbly drink continued with various friends. And the day was always wonderfully celebrated and filled with love. And moving to Colorado, finding The Boy, and losing my hook up with Valentino’s Pizza can’t stop me. It’s tradition. And I continue to want to celebrate that way. Good news friends – my loving Boy is flexible and willing to share LOVE day with other friends, a pile of board games and questionably decent pizza. 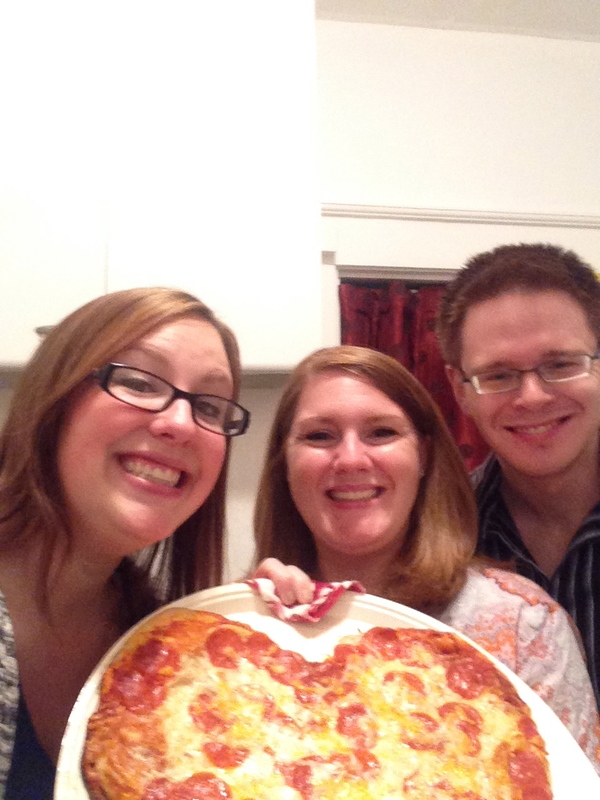 My gingers (they wore their red hair for Valentine’s Day! How thoughtful!)! The pizza! A perfect night. So from my home to yours, a very happy (and obviously belated) LOVE day! And note: if you’re ever in my vicinity around mid-February and you’re coming from a town that DOES have Valentino’s… I wouldn’t be mad if you brought me a heart shaped pizza to cook at a later date… I promise to love you for forever. People, I have giant, life-altering, incredible news. And by that, I actually just mean I have generic news, but I’m REAL excited to tell you about it. I have finished watching Chuck. Anywho, I have officially watched all 91 episodes of cute-nerdy-geek-squad-turned-undercover-spy-asset Chuck. I did the math. That means I’ve spent a whopping 63 hours of my life watching a television show. Let’s not think of the part time job I could have had with that time. Or how that amount of hours would basically get me my realtors license. Or anything else productive. Let’s instead look at it as I started a large undertaking and I finished it. I’m SUCH a goal master. I’m also a rock star girlfriend (because yes it IS The Boy’s favorite show, which, may or may not be the reason I was watching it in the first place…). But enough about me. Check out this cast of people that have become my fake friends. Come on. They just LOOK like fun don’t they? So fun YOU TOO could spend 63 hours of your life with them. So much so that by the last episode I was SOBBING over them. Which, is only terrible (read: embarrassing) since it’s The Boy’s favorite show and I was watching it with him. I think he was worried I was broken. Nope. Not broken, just crying over fictional characters. NBD. Oh, that’s not how you watched it because you’re a boy? My bad. So if it’s looking like you have a large chunk of unaccounted for time about to hit your hands (or you just generally think sleep is overrated), might I suggest this show? Why yes, it is on Netflix… AND it’s boy/girl friendly. And I think appropriate for all ages (I don’t have children, so while it seems appropriate to me, some might say I’m a bad judgment call there)? It’s just a nice, friendly, happily little show about a cute nerdy boy (that you will fall in love with), a will they/won’t they situation with his sassy blonde co-spy, and the stinking best random supporting cast of characters ever. Thanks for 63 hours of laughs (and ::shakes fists:: tears) Chuck. You’ve been great. And to the rest of you, I’m sorry that I just potentially inspired you to waste devote every night for the next two months watching this show. You can thank me when you’re done*. *Ahem, unless you hate the ending, which, I hear some people did. But I thought it was nice. I guess have low expectations going in and there’s a better chance all will end well! One Whole Year In Colorado. 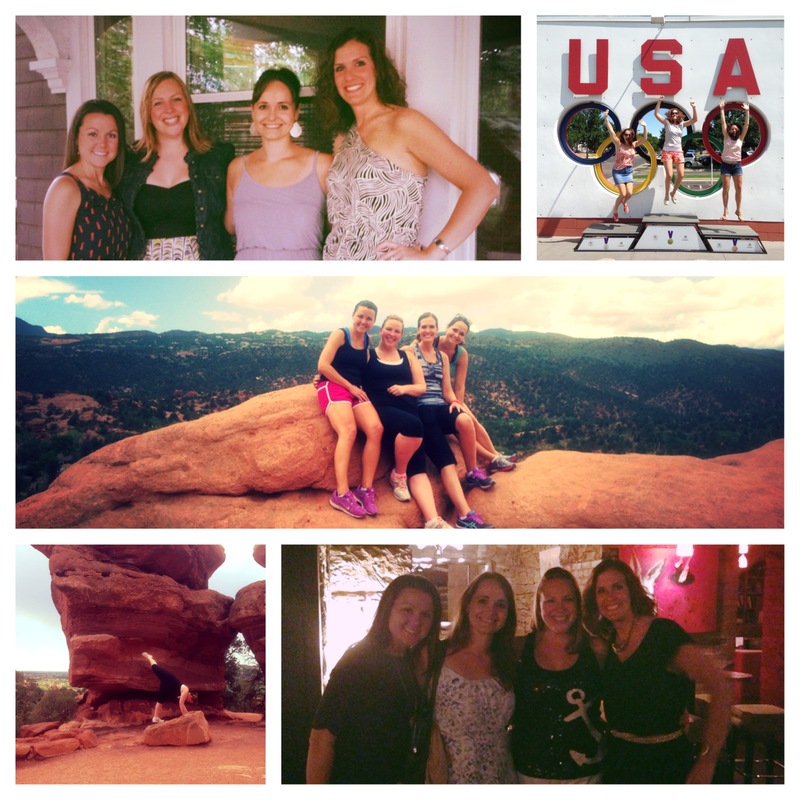 I wanted to write a post and tell you all of my most favorite or most impactful things from 2013. A little year end wrap up if you will. A way to describe the first whole year of living in another state. To laugh about almost nearly torching my apartment to the ground with an oil fire. To remember the time I was THAT crazy cat lady who made a liter box cabinet for her cat that has… NEVER BEEN USED. Or reminisce about when I was worried that the Selena look was making a come back. I mean, isn’t that what Buzzfeed would want me to do?! But here’s what I realized, this has just been an incredibly wonderful hard strange year. End of the year Betsy just feels like quite a different person than beginning of the year Betsy. And I didn’t have a great way of picking the ‘ten best/worst/most interesting things that happened’ simply because things just felt like they were on a different scale at different parts of the year. There’s the hard parts of the year. The part where I lost family members I cared about and couldn’t be there immediately to hug my loved ones. The part where I ended a long term relationship that basically just broke me into pieces. And the part where I missed all of my friends living 500 miles away from my new life so badly my soul hurt. But then there’s the other parts. The second half of year the year. That’s the part where I bought skis, tried rock climbing, learned to live on my own and fend for myself, found geocaching, explored my new state, learned the art of organization, the joy that a clean color coordinated closet can bring you, made some successful meals and taught people in this state that chili and cinnamon rolls is an actual legit combination. And while doing that, I found some wonderful new incredible friends. The ones that invited a stranger to their birthday parties, their church outings and their weekly activities. The ones that listened to my doubts and drank wine with me on my porch just because. The ones that spent lunch hours with me tagging along as we went shopping at their favorite boutique. The ones that are always game for a pedicure and will absolutely eat dinner with you at that nasty fried fish place that no one ever wants to admit they go to. And the one that I didn’t know at all, but moved in with me so I could afford rent and somehow magically puts up with my crazy animals and makes me laugh on a daily basis. And somewhere in the midst of all of that I stumbled upon a wonderful new man that gently helped me pick up those pieces my heart had broken into and put them back into place. And then I fell in love with that very sweet and incredible man who brings out the very best of me and makes me laugh at the little things in life again. And being only 500 miles from home allowed me to travel home when I needed too. The funerals, the weddings, the sorority events that I just couldn’t miss, the basketball games my brother played in, the graduation of that same brother from high school, the major events and holidays with the family. And even though I didn’t want to do a year end wrap up, what I did want to do very badly was thank everyone that participated in this year of my life with me. So, to those of you in my life in 2013, thank you for all of the joy you brought me. Thanks for the phone calls, the in person visits, the invites to lunch, the comments on the blog, the random posts on my facebook wall, the FaceTime calls, the handwritten notes, the recipe sharing and the Christmas Cards. Because if anything was consistent through the year, it was the incredible love of my friends (and family!). I owe you all my healthy mental state. You guys rock. Here’s to a blessed 2014 for each and every one of you. And don’t worry, even though I’ve turned into a total ski bunny granola eating Coloradan (bwahahaha – NOT) I promise to continue to blog through the good, the bad and the hilarious. Upon opening the Betsy Blog, you’d better believe I laughed (hard and out loud) when I realized my last post was November 15th. Here’s where I insert something generic about good intentions, blah blah blah. Yup. I said it. I. Have. Been. Busy. With real life friends. Outside of the house. Not too long ago, I had a dear friend call me out. Hard. It was one of those best friend smack downs that only they can somehow make sound loving, but you know when receiving them that they are 100% correct… and they are telling you because they care enough about you to actually say something. Anywho, while whining about this and that, she just simply told me to fix it. If having free time was killing me, she asked what I was doing to work to fill that time and I just sat silently staring. “Um… nothing.” “Then stop complaining” she says. Bam. Best friend smack down. And guess what? She was right. I can’t complain about something that I’m not actively trying to fix (which, could be applied to SO many situations amiright?). So what was I going to do to about? So that’s quite honestly what I’ve been doing. Finding things in the town that I’m living in that I enjoy doing and connecting to people while doing those things. Which, has involved having to leave my sweatpants and flannel tops at home and leave the house. Sometimes, I even add a full face of makeup. I know, wild right? This stuff isn’t for the faint of heart. It’s real effort to walk into some random mingle/networking (good Lord I hate that word) event. But, so far, putting in a little effort has made things so much more awesome. Case in point: Today I had an amazing lunch. With an amazing lady. We chatted. We laughed. We ate good food (thank you baby Jesus for grown up grilled cheese and tomato soup) and we just had an all around good time talking about whatever was on our mind. It didn’t feel like an uncomfortable first friend date. It felt like I was sitting down with a good friend. And that brought my heart joy and happiness. And makes putting yourself out there and asking someone to have lunch with you totally worthwhile. Granted: I still maintain that organizing things, keeping a decently clean (errrrr um, mildly clean) house, learning to spend time by yourself, making the meal that you’re eating every once and awhile… those are important. But I think I’m reaching a much better equilibrium… because I thrive being connected. I’m better when I’m busy. And taking in all of the adventures that your town has in store for you… that’s crazy important too. So on my night off tonight, I’m going clean. I’m going to do laundry (which, for the record, I STILL hate), I’m going to finish wrapping Christmas gifts, I’ll answer some emails that need tending to and I’ll write out another blog post or two (seriously, wait until you hear the squash disaster of 2013). But know, I so encourage you to do the thing that you’ve been putting off. Put yourself out there. It’s just so stinking great. No seriously, that’s all you have to do. Keep in mind that throwing a garage sale means: having enough stuff, advertising it, putting up signs, standing in your front yard for like 9 hours and then having a plan for what to do with the stuff that DOESN’T sell. OR you find someone else with enough stuff, let them do all the pre-work and clean-up work and you just provide the yard. Which is the path I took. I’d never experienced the joy of haggling with all of the really random strangers that come to the front yard. It was great. But truly – the best part was meeting my lovely and adorable neighbors. They were all SO nice. Wanted to know my story (which I LOVE) and generally cared about making sure I enjoyed my time on the street. And now, every time I leave the house, I can say hello to them when they are out and about in their front yards. Which is the BEST. FEELING. EVER. And one of them invited me over for wine on her front porch. Which, is just about the most wonderful thing in the whole wide world. SOMEONE WANTS TO BE MY FRIEND! And after the garage sale, I had only about enough energy to shower, throw on leggings and a t-shirt, drive to get a slushie (always an instant pick me up) on the way to the boys house and then nap. Because just standing in your front yard talking to strangers and moving things around – is EXHAUSTING. So to those of you that do this whole garage sale mess on the regular – hats off to you. And to those of you that are alone-ish in a new city and want to feel like you have protective people surrounding you. Get out there. Meet your neighbors. 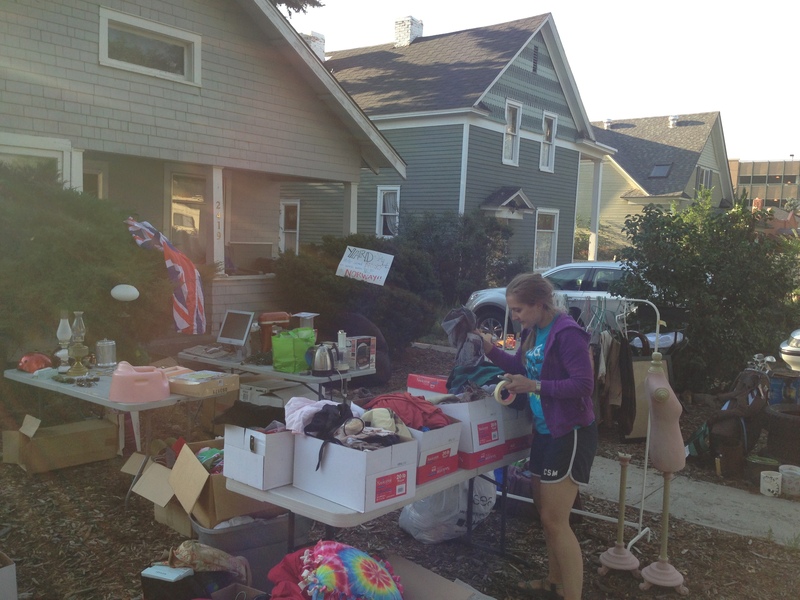 Throw a garage sale! Or, go the traditional route and bake them something. Remember the amazing Emily Gray I told you about yesterday? She invited me over for dinner because her husband makes incredible chili. AND GUESS WHAT SHE DID?! Okay, the title probably gave it away. But, CHECK THAT OUT! They know how I feel about cinnamon rolls being paired with chili. They know I think it’s normal. And because they LOVE me… they made them for me. Adorable. Knife Girl and Emily Gray for the win!! They are just wonderful friends. I mean, they are actually sisters. But they are wonderful friends… to me!! That’s all I had to tell you today. Just know, my heart is filled with happiness and joy right now! I went home this week, spent a lot of great time with family, friends, my YL girls and time just visiting my favorite places in my hometown. Plus, K got to swim in a real life lake. Which was awesome. Seriously, I almost feel guilty for not living closer to water for her. Not the point of the blog post. The point is… at one of these amazing catch-up meetings my darling friend Nia told me all about a “get to know you mixer” that they had used for her board as an actually fun way to get to know you better. Which, if you’re involved in a lot of get to know you activities, you realize is a tough job. Mixers are fun. Once. And then you play another mixer and you’re ready to gouge your eyes out. And that’s coming from a “I LOVE GETTING TO KNOW PEOPLE AND EVERYONE NEW CAN BE MY BEST FRIEND” type of person. Everyone picks a “song that describes their life” and a “guilty pleasure” song and then you read the titles, guess who it might be AND GIVE EVERYONE MIXED TAPES AT THE END. Which, regardless about the painful actual mixer part – you end up with a whole CD full of random fun tunes. Now come on, that idea is GENIUS. Plus, it got me thinking… if you had to pick one song to describe your life and one guilty pleasure song, what would you pick? Luckily, I had an 8 hour drive home to really noodle on this – because it’s difficult! Do you go serious? Do you go funny? How far can you push the envelope if you’re on a professional board and you’re supposed to look professional? I mean, that basically cuts out T.I. and DMX… right? So I’ve settled on these tunes as professional – yet – upbeat and accurate! Plus, they both brought a smile to my face and I’d hope when it got to that track on the CD they’d bring a smile to that person’s face as well. And not in a super depressing, I feel alone way. But in the HECK YES LET’S DANCE THROUGH LIFE!! sort of way. Runner up options: Unwritten (Natasha Bedingfield) & Perfect Day (Hoku). Okay – don’t judge. You KNOW you want to drive around town blaring that and singing it at the top of your lungs. And yes Maika and Gwen, this is totally a shout out to you two and the glory days of Petunia and gas station cappuccino. Runner up options: Anything from Beyonce (obviously), Popular (Wicked) and something from Trans-Siberian Orchestra (yes, I’m a nerd, I own that). Seriously, how genius is this mixer? Flipping genius. Just go ahead and give Lincoln AMA props if you steal it, I’m sure they won’t mind sharing. So those are mine. Noodle on it for a minute… what would you pick? Feel free to share in the comments, I’m dying to know!! The very best ones? The ones that always laugh at your jokes. They enjoy partaking with you in fun girly activities or just siting with you, lounging in comfortable silence. They know how to how to be classy – even at a dive bar and they know the exact right time and way to deliver compliments to you to touch your soul?! Really, these are the friends that just make your life better because they’re in it. Well, those girls came to visit me this weekend. I laughed. Oh how I laughed. Hard, with gusto and a few really good snorts – the. entire. weekend. And throughout the whole thing, they just reminded me of how lucky I am to be blessed with some seriously rock star, fantastically wonderful, high achieving, amazingly talented friends. We ate. We hiked. We ate. We dressed up. We ate. We shopped. We ate. We lounged. We ate. And kids, we ate good. In an amazing geeky foodie way that I haven’t gotten to experience in a long time. My goodness I love these friends. I showed them around my new town. We saw the sites. They saw the new place. They loved on my pets. They were up for anything and everything. And they brought me Runza. Runza is great. If you don’t like it, we don’t understand you. 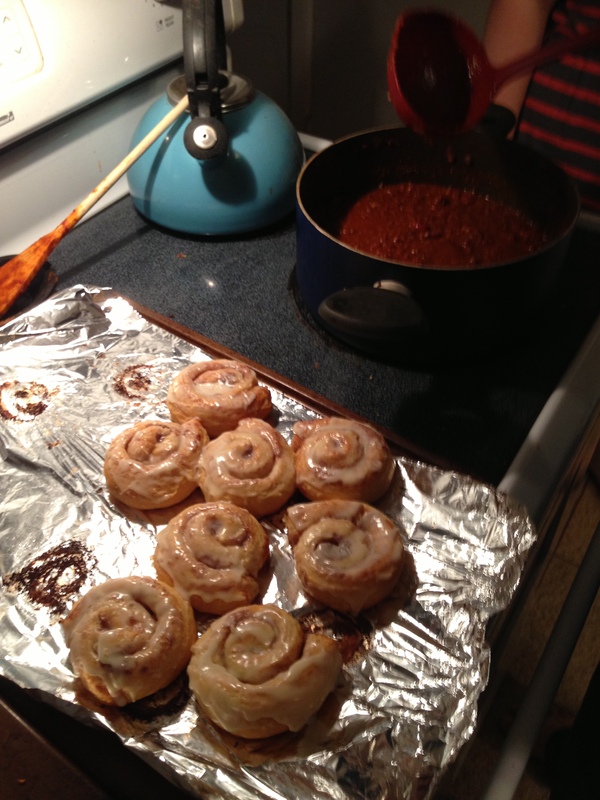 Chili and cinnamon rolls as a combination is legit. People from a state should know geographically the border states and where they are positioned. Elevation on a city sign is weird, it really should be population. Measuring distance should only be noted in time… not miles, that means nothing to us. Shopping is an art form. Okay, that last one is maybe not a serious lesson, but it is true. And these girls appreciate the beauty in that art form. 110%. If you’re not catching on… long story short… I adore these girls. And I already miss them like crazy. So to my AMA ladies: I love you for visiting. I love you for listening. I love you for sacrificing time out of your crazy hectic schedules for our together time. I love you for being flexible and rolling with the punches. I love you for asking the hard questions. And I LOVE that you bring me so much joy. And be ready for the “Girls on Rocks” 2014 calendar. It’s happening. And it’s going to be magical. If you know me at all, you know that I love and adore Young Life. I love working with high school kids, being silly and acting crazy comes naturally to me and to top it all off I heart Jesus. AKA – I’m fairly certain I was put on this planet to be a Young Life leader. Every week I head to Young Life Club. We play games, we sing songs, we do skits and then we deliver a gospel message. It’s a place each week that kids are welcome to come, let loose, be free from judgement and know that someone there cares about them. Someone wants to know how their day was, someone smiles when they walk in the door and someone just plain knows they exist. Because high school is hard. And having someone there in your corner makes it just a little easier. So sing songs, play silly games and act like a fool it is. I’m in. Bring it on. And of all the silly things and all the crazy skits, I have one absolute favorite that tops the rest. I’m not sure if it’s because of the actual skit itself, or if I love it because I remember everything great about it from when I was in high school and my fabulous wonderful amazing Young Life leader was in it. Tough call. 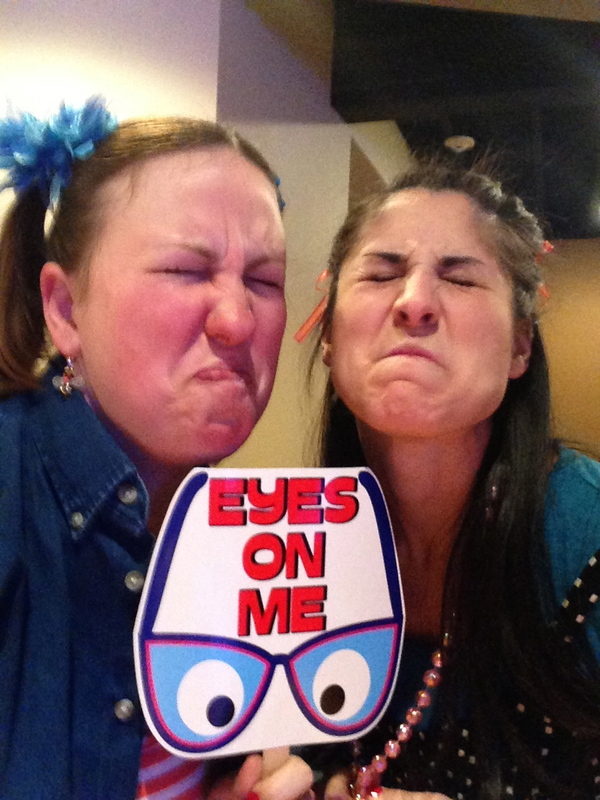 But this week, this week I was lucky enough to get to participate in the skit myself. I wish I had gotten video of it, I really do. Because it’s great. It’s funny. It’s hysterical. 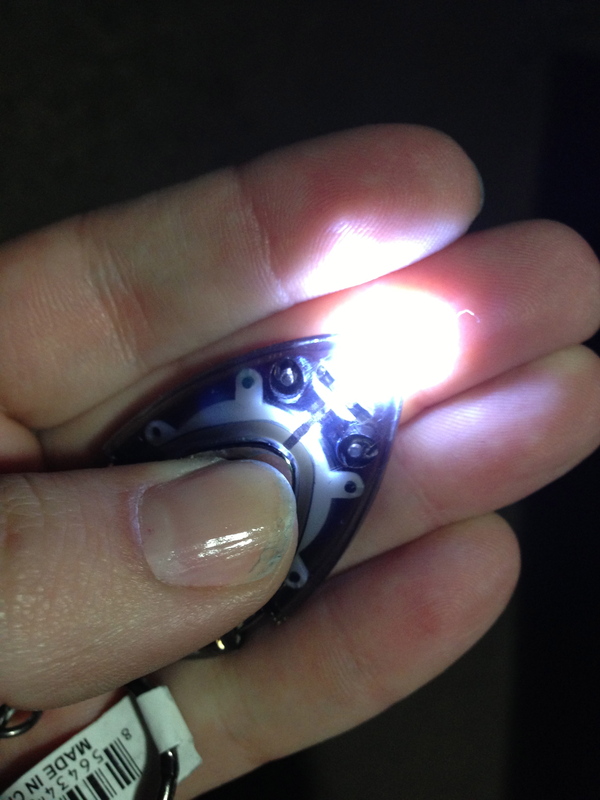 General concept: You and another leader go back and forth playing dueling banjos… but instead of playing the banjo… you use LED pen lights… and you play your nose. You’ll have to just look at this video (around the 1:00 mark) of these guys playing and then combine it with the picture below to get it. Yup. Two of these guys. In my nose. So pretty. So random. So. Much. Fun. This picture also begs introduction of my good friend… The Church Lady. It only seems fair to introduce her with another club shot. It was kindergarden club. We were disobeying the teacher. Roll with it. 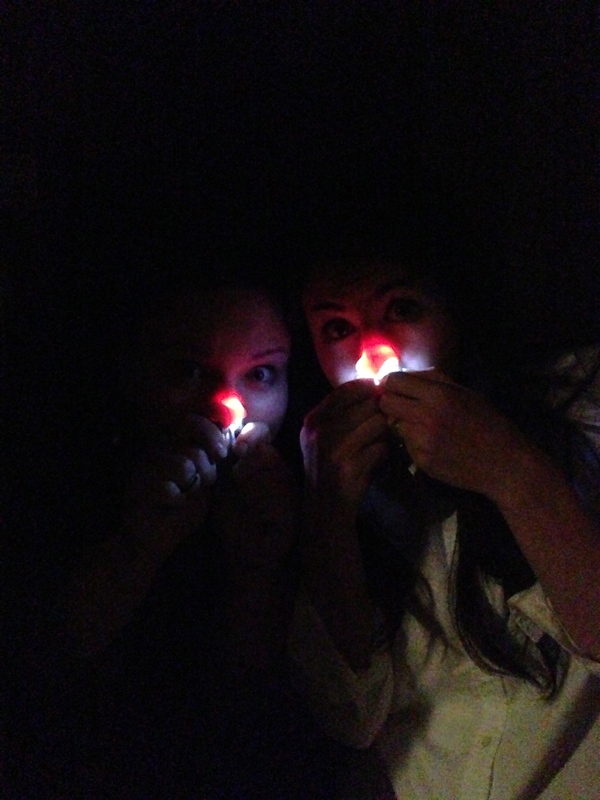 My partner in crime with the pen light. This girl is the first friend I meant in Colorado. On the porch of the house we stayed in when I came out to find an apartment. She willingly volunteered to show up, take us to church (thus the nickname) and be nice to a complete and total stranger. The first night I was in town, she invited me to go through the grocery store with her. Which may not sound awesome, but when you move to a new town, you have no food and you don’t know what the grocery stores are called – this is the worlds largest blessing. Not to mention, the night before I started work, was Halloween. I had no friends and was largely at risk of sitting at home alone watching Hocus Pocus with a bowl full of candy. Yikes. But The Church Lady invited me into her home, introduced me to her people, and calmed my nerves before day one of my new job. She was the one that I first opened up to, the one that let me come over bawling after dropping off the boy at the airport and the one that let’s me get my house decorating fix in by talking to her about re-arranging her entire kitchen (…you’re right… your sink isn’t centered on the window… but you could totally fix that by knocking this wall out, adding storage here, moving your fridge there…and on and on). Smile. I am so incredibly thankful for her. She’s truly a blessing. She’s sweet. She’s funny. She’s kind. Don’t worry – I’m not a total creeper. 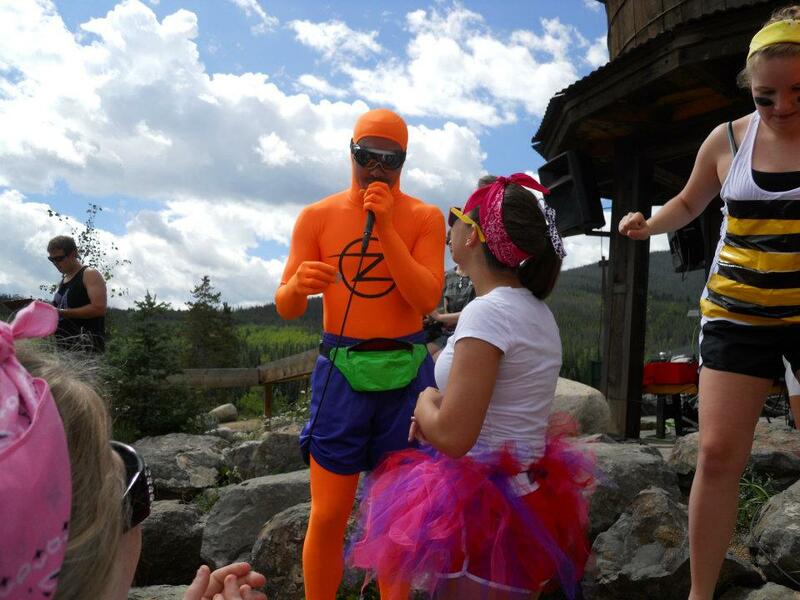 Orange Spandex guy happened to be at camp this summer when I brought my girls. Small world. Young Life Camp. Does it get any better? We’ll call him Orange Spandex Guy. I know, I know, I’m so creative. He’s the guy that didn’t believe me when I told people that chili and cinnamon rolls were a thing. He questioned the level of culture in Nebraska… but he’s been the most fun to watch try these new things. Because he’s just that – fun. And when I’m in a bind – it’s these two I call. Example: They were the ones that came over after I nearly torched my apartment and then spent their evening helping me clean up the baking soda (that was EVERYWHERE) and then took me out for dinner. Oh and Orange Spandex Guy happens to be my area leader. He runs the show. Basically this long aside is to tell you that they are just a neat couple. And I’ll keep my fingers crossed that I play another round of Dueling Banjos in the near future so that I may record it and become a giant YouTube star. You know, that or just share it with all of you.